The Law Office of Patrick Jennetten, P.C., focuses on one-on-one advice and practical guidance for personal injury and workers’ compensation cases. Because the office is comprised of lawyers and advisors, relationships are at the heart of their practice. Creative Mellen was asked to develop a modern brand that would break the mold of the typical, stuffy law firm approach. The Law Office of Patrick Jennetten skillfully gathers evidence, negotiates, and argues cases in court and gets results. They also spend a great deal of time with their clients—listening. This expertise and personalized service combine to provide “protection” for their clients. From this messaging, we developed an identity that illustrates how they “shield and protect” clients in their claims by using a shield and gavel in the logo. This approach, while rooted in the law, is a more welcoming identity—better representing the office’s style. Color played an important role within this brand too. We stayed away from the typical, stuffy browns, reds, and greens. Instead, we used different blue hues for a professional, sophisticated overall look and feel that helps them stand out in the market. 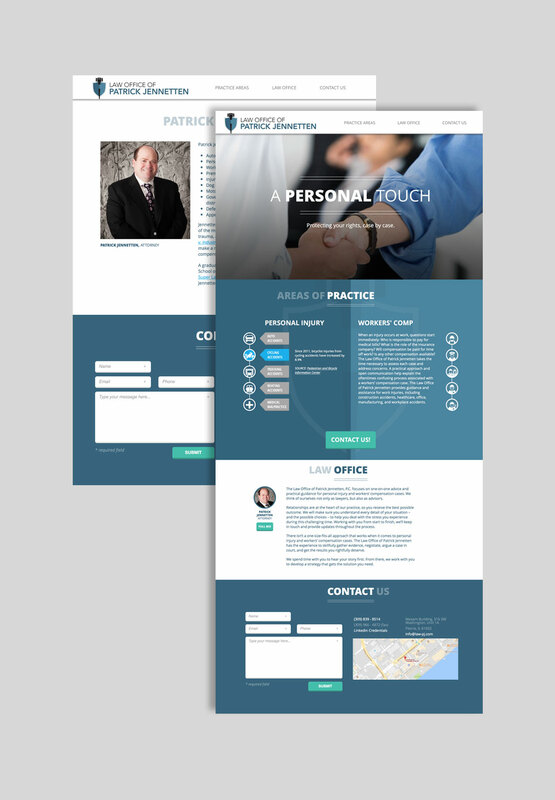 With simple animation and statistical rollovers, we designed the straightforward, information-rich website to reflect of a more modern, informal approach to personal injury and workers’ compensation firms, while educating clients and conveying service information in enhanced ways.